This is Janet, Kilimanjaro is peaking through the clouds, and we have volcanic rock all around us. It is marvelous. Hi this is Joe, want to say hello to Barbara, Lauren, Joey, Lucie and my dad. Beautiful here. 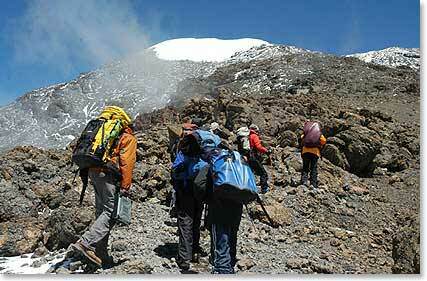 Kilimanjaro is snow covered, and the guides are really nice. I want to say to the people I work with I miss you and you should send me more handy wipes. We are doing well and having a great time.